We are a leading Exporter of pipe balancing stand and universal pipe stands from Jalandhar, India. 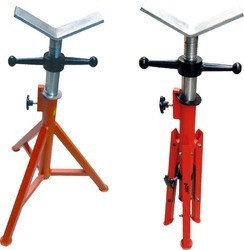 We are a highly acclaimed name to offer best quality Pipe Balancing Stand that is known for its fine finish. 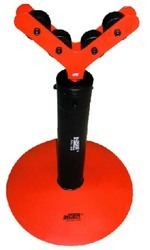 Pipe balancing stand are designed after regular feedback from the users. It is used while threading on long length of pipes. Our firm brings forth the clients an enthralling range of Universal Pipe Stands. The range is designed and made in compliance to industrial standards, under the strict vigil of the quality inspectors. We make use of top notch hi tech machinery, tools and accessories for the manufacturing of Universal Pipe Stand. Sturdy construction, robust design and high performance are the features for which the range is appreciated all around the globe.